Education Bachelor of Science in Allied Health Physical Therapy in 1991, University of Connecticut Bachelor of Science in Biology in 1988, University of Connecticut Certifications Graston Technique® Trigger Point Dry Needling Certified Kinesio Taping Practicioner (CKTP) Clinical Specialties Sports medicine, specifically the treatment of the shoulder, knee and back. Organization Memberships American Physical Therapy Association Rotary International Naugatuck Chamber of Commerce Outside of the clinic… Joe spends a lot of time getting involved in his two daughters’ activities. He’s also an avid sports fan! Some of his favorite teams include UCONN basketball, NY Yankees and Jets, A.C. Milan, and F.C. Barcelona. Joe is also Partner of PTSMC Watertown. Education Doctor of Physical Therapy in 2017, Seton Hall University Bachelor of Science in Biology in 2014, Seton Hall University Clinical Interests Mike enjoys helping people back to work or sport. 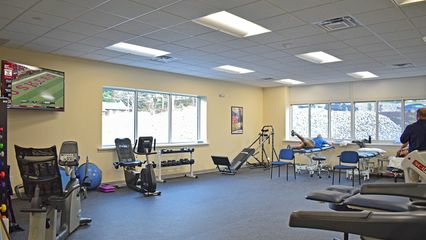 He particularly loves treating injuries of the shoulder, knee and hip. Recently, Mike completed continuing education in cervical and thoracic manipulations. Prior to joining PTSMC, Mike was a poster presenter at the 2017 APTA Combined Sections Meeting in San Antonio, TX for “The effects of Sound Exposure on Postural Sway and Muscle Activity in Healthy Young Adults: A Methodology Study”. He is planning to become a Board Certified Specialist in Orthopedics. Organization Memberships American Physical Therapy Association Outside of the clinic… During his free time, he enjoys fishing, hiking and working out. Mike’s favorite sports teams include the New York Giants, New York Mets and the Notre Dame Fighting Irish.